A perfect Christmas present! 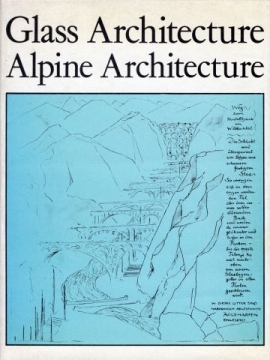 copies of Scheerbart’s Glass Architecture and Taut’s Alpine Architecture, published with English translations in 1972. Taut’s illustrations are fantastical, ecstatic – cities growing like crystals between mountain ranges, summits chiseled to geometric cut-glass forms. Sinta Werner’s 2010 collage series Zwischen Lenggries und Schwarz are a lot like Taut’s drawings – hallucinatory visions of snow-topped Swiss mountains. Folds in the paper echo forms in the rock strata sculpting actual peaks and troughs (“sharp, faceted excrescences”) in the flat photographic images. 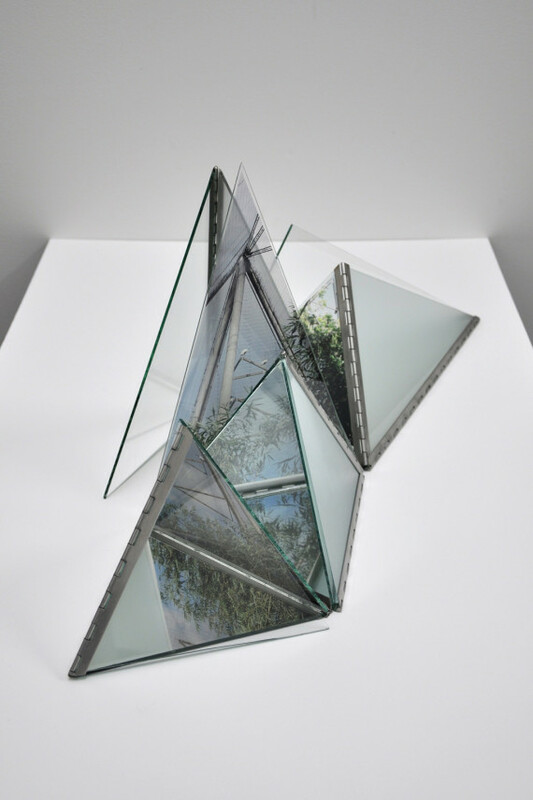 Broken bits of Pieces, Werner’s assemblages of colour slides and mirrors create intricate tectonic collages from simple architectural photographs. Domestic interiors – radiator panels, herringbone floor tiles – are doubled, mirrored in the glass, fracturing and exploding everyday spaces. The panels are like precarious stage flats for miniature theatre sets. If Werner made a 16mm film, what might it look like..? Last week Rob and I photographed the pyramids again, this time with images of the aviary in their panels. 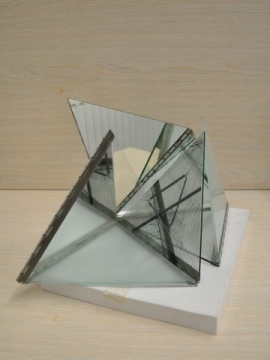 Just inkjet prints on acetate for the purposes of these tests but it gave an idea of how the objects might be actuated – either by video/film projections or by reflections on a location shoot. 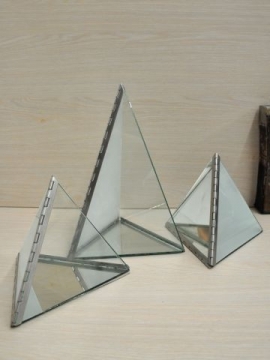 The new, taller pyramid begins to suggest a landscape, a range. Unfolding the hinged panels opens up seemingly infinite compositional (topographical) possibilities. Update February 2016: This post marked the end of one phase of research, and of my and Robert’s a-n supported collaboration. 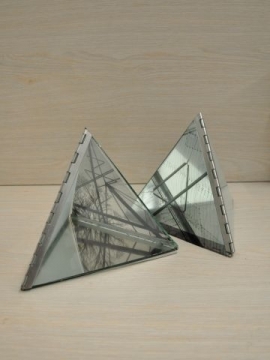 Posts on michaelanettell.blogspot.co.uk document Part II, in which I have used the glass pyramids to create a series of paper collages, animated GIFs and a modular sculpture ‘Model for a crystal geometry’. 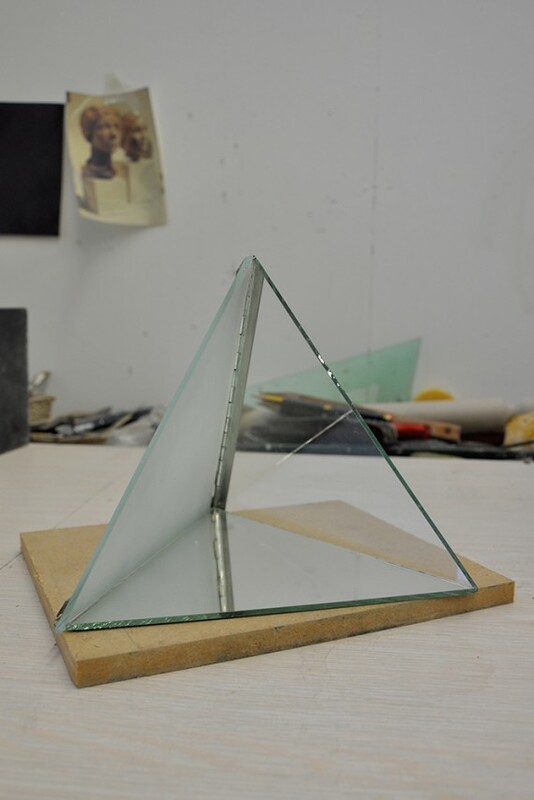 Last summer Robert and I expanded the sculpture with two new pyramids – one of these a remodelling of the third, ‘tall’ tetrahedron which I had originally designed with its mirrored panel in a different part of the net, making the piece too heavy and opaque. The body of work is ongoing and plans for this year include studio shoots of the sculpture in preparation for 8 or 16mm filming and photo/film shoots at Frei Otto’s aviary at the Hellabrunn Zoo, Munich.